The Vancouver condo market remained robust through February. Despite continued regulations aimed at cooling the Vancouver Real Estate market, including the BC Governments recently announced 30 point plan, strong demand and aggressive bidding wars persisted. While some demand has been pulled forward as a result of recent mortgage regulations, the full extent of recent changes have yet to be seen and may not fully rear it’s head until later in 2018. Vancouver condo sales fell by 6% on a year over year basis. This is a trend that will likely continue from the resulting policy changes aimed at curbing demand. Vancouver condo sales for the month of February were 3% below the ten year average, and well peak sales activity in February 2016. 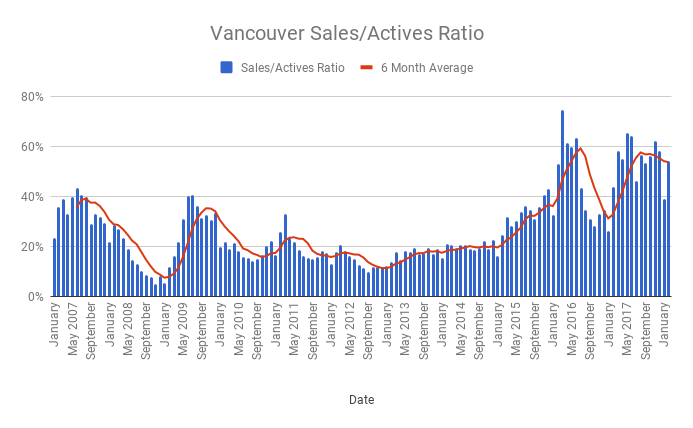 Vancouver condo sales using a 6 month average highlights the shift towards declining sales volumes. 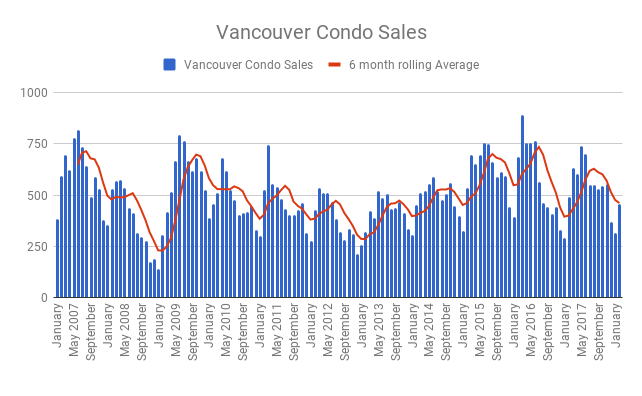 Vancouver condo sales as of February 2018. New listings had a nice rebound following a dismal February 2017, growing by 18% in February 2018. Despite the year over year growth, new listings were still near historically low levels for the month of February, coming in 14% below the ten year average. 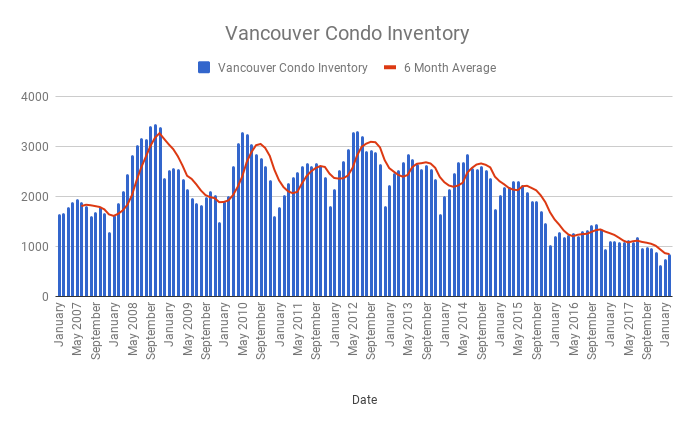 Vancouver condo inventory levels continue to garner headlines, ensuring what many within the industry believe is a supply issue. Despite a record high 42,000 units under construction, lengthy delays have suppressed any relief on the supply side. Further, speculative demand continues to be active in the condo market, stirring up additional demand for investment properties. Combined, this has kept inventory near record lows, falling 24% on a year over year basis. The sales to actives ratio for the month of February was 54%, indicative of a strong sellers market. This follows the typical trend of a higher sales to actives ratio heading into the busier spring market. The average sales priced dropped in February following an unexplained spike in January. The average sales price now sits at $974,034, a 24% increase year over year. The median sales price also took a slight dip to $785,000, a 23% increase year over year. The Vancouver condo market remains surprisingly resilient. This is mostly a result of extremely tight inventory levels which is forcing buyers to compete in bidding wars for available supply. Sales volumes continue to trend lower which could provide price relief if inventory is able to catch up. This is far from an overnight fix, despite aggressive policies aimed at cooling the market. However, with mortgage pre approvals nearing expiry we will begin to see the implications of a new mortgage stress test later this spring, as well as the termination of the BC Governments first time buyer loan program which was able to leverage some buyers into the market.